Nail fungus is a fungal infection that may cause your nail to discolor, thicken and crumble at the edge. It begins as a white or yellow spot under the tip of the nails (fingernail or toenail). Nail fungus is also called onychomycosis (on-ih-koh-my-KOH-sis) and tinea unguium. If the fungus infects the areas between toes and the skin of feet, it's called athlete's foot (tinea pedis). The infection severity may range from mild to severe and treatment is tailored accordingly. Few self care tips can be followed up by the patient. Fungi are microscopic organisms that grow in warm, moist environments. Fungi don't need sunlight to survive. Some fungi may be beneficial, whereas others may cause infections. 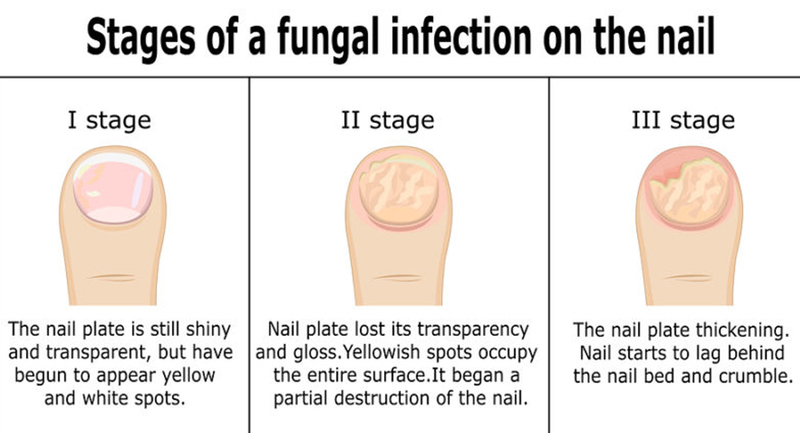 If you experience any of the following symptoms in one or more of your nails, it may be indicating a fungal infection in your nails. Dermatophyte fungus is the most common cause. But Yeast can also cause nail infections. Easy to develop in older age, as the nail ages and becomes dry and brittle. Poor blood circulation, diabetes or a weakened immune system may also contribute. Wearing socks and shoes for long hours, hindering ventilation. You should visit a physician if the nail becomes increasingly discolored, thickened or deformed. Also, see a doctor if you have diabetes and think you're developing nail fungus. Prevention is better then cure, and so, below are few habits that can help you prevent fungal infection in your nails. Wash your hands and feet regularly and dry thoroughly. Moisturize your nails after drying. Wear sweat-absorbing socks or change your socks regularly. Opt for shoes that reduce humidity, antifungal powder may also help. Don't trim or pick at the skin around the nails. Avoid nail paints if you have mild fungus, it may increase the moisture. Avoid walking barefoot in damp areas. For best treatment guide contact the Dermatologist to get the Nail Fungus or Nail Disease Treatment in Gurgaon at Skin Care World.